That you assisted us with. Your fantastic organisational skills and friendliness made a massive contribution to an outstanding albeit short holiday. The private long boat tour with Bee was incredible. She is a wonderful lady whom I hope to meet again. Lunar from the tubing tour was like a ray of sunshine and we loved being in her company. The tubing was great and we lived the fact that it wasn't over run with people. Thanks for that excellent advice. 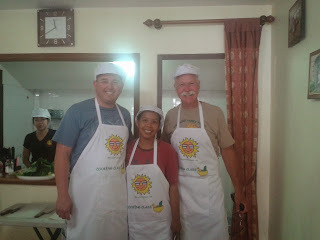 The highlights for me, however, was the private cooking class with Bee and Anne. It was so personal, Anne was so warm and welcoming, being in her home was a privilege and one I would have hated to miss. It was informative yet casual and I felt I was cooking with friends. Your advice regarding that incredible restaurant, jok ......was spot on. What a place. We didn't want to leave. Thanks for going out your way to make and then reschedule our reservation. Dee also went our her way to book us our unscheduled trip to watch Thai boxing,even instructing the driver to take us to collect the tickets. I will, without any hesitation, tell any other people that are planning on travelling to Thailand, not to waste their time with any other tour operator and we will definitely be utilising your amazing companies services on our trip next year. There are four different things you need to make: Marinade, Basting Sauce, Satay Sauce and Ajad. over it. Remove 4 tablespoons of the water and set to cool. 2. For the can of coconut milk, don't stir it up, and some will have a thicker consistency. ingredients. Mix well, then add the pork, and refrigerate for 1 hour or more. aside. Then pound the peanuts until fine, and set aside. mortar. Heat a wok or large pan to medium heat, and add this mixture from the mortar. paste, fish sauce, tamarind, palm sugar, and stir well. 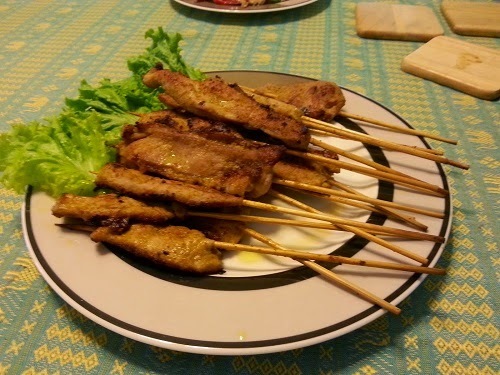 Cook the marinated pork skewers over charcoal, constantly basting them with the basting liquid. Serve together with Satay sauce and Ajad. More about cooking Thai Dishes on our Thai Recipes Page! 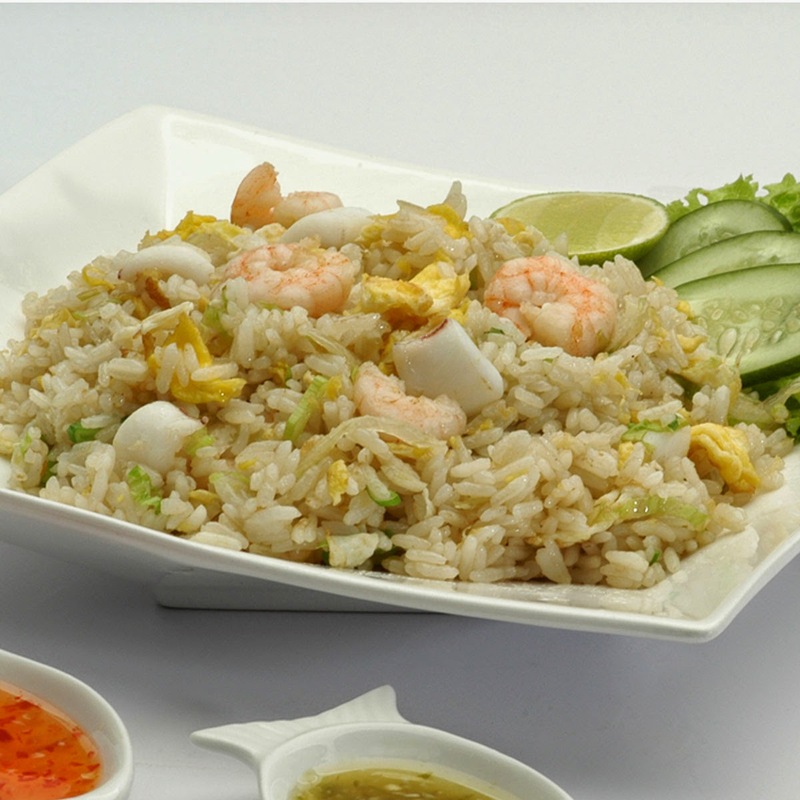 Fried Rice is a very simple Thai dish and easy to make. I always had my Fried Rice with Vegetable Soup (Thai style) or Tom Yum Soup on the side for more taste. Place oil in a wok, add garlic and chilli stir-fry over medium-high heat until fragrant ( about 1 minute). Add prawns* and squid*, then stir fry until cooked thoroughly. Move ingredients aside and crack egg into the wok, stir to cook and break up the egg, when egg is nearly cooked add the rice, stir fry, keeping the heat medium-high. Add fish sauce and tomato, continue to sir-fry for another 1-2 minutes. Before serving, sprinkle with onion and coriander on top and place cucumber and lemon beside the fried rice. * seafood can be substituted with chicken, pork or beef. NOTE: Once in the plate, Thai people love to season the Fried Rice with chopped chillies in fish sauce and lime for better taste. 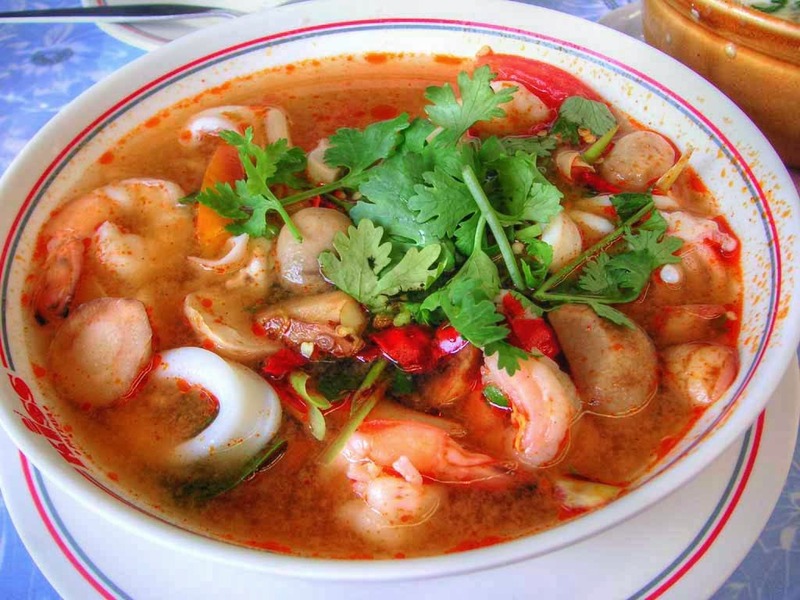 Spicy, salty and sour soup may not sound very tasty for those that never tried Thai most popular dish "Tom Yum"
Bring stock to boil. Add galangal, lemongrass, lime leaves, shallots, mushrooms, chilies and simmer until fragrant about 2-3 minutes. Add prawns and simmer until they have just changed color. Season with fish sauce, sugar and lime juice, cook briefly about 20 seconds and sprinkle with spring onions. Remove from the heat immediately. Laddle in the soup, serve sprinkled with spring onions and seasoning oil. The soup should be spicy, salty and sour. For serving later is better to add prawns at last. Some people like to add also tomatoes to the recipe, it can be done at step 1. Chicken can be used as substitute, but add chicken before mushrooms and tomato. You can get more flavor of prawns by using also the head. 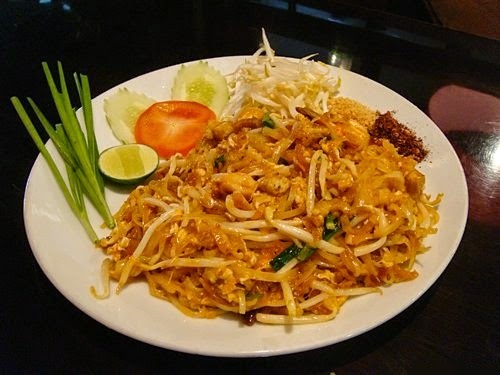 Phad Thai is one of the dish that many people been order when they try Thai food for the first time and if you are vegetarian it could be just perfect to make without meat. Simple and delicious! Start with soaking the dry noodles in lukewarm or room temperature water while preparing the other ingredients, for about 15 minutes until they get flexible but not too soft. Toast the peanuts in a pan until lightly brown, about 3 minutes on low heat. 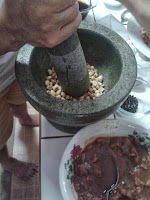 Coarsely grind peanuts with pestle and mortar. Heat the oil in a wok and add garlic, preserved turnip and tofu and stir them until they start to brown. At this point the noodles should be flexible but not expanded, drain them and add to the wok. Stir quickly to keep things from sticking. Add tamarind sauce, sugar, fish sauce, oyster sauce, and chili pepper, keep stirring. The heat should remain high, if your wok is not hot enough you will see a lot of juice in the wok at this point. Turn up the heat, if it is the case. Make room for the egg by pushing all noodles to the side of the wok. Crack the egg onto the wok and scramble it until it is almost all cooked. Fold the egg into the noodles. Add bean sprouts and chives, stir a few more times. The noodles should be soft, dry and very tangled. Pour onto the serving plate and sprinkle with ground pepper and peanuts. Serve hot with a wedge of lime on the side, raw Chinese chives and raw bean sprouts on top. *Shrimps can be substituted by chicken, beef or pork. NOTE: in Thailand, condiments such as sugar, chili pepper, vinegar and fish sauce are available at your table for your personal taste. Some people add more chili pepper or sugar at the table. 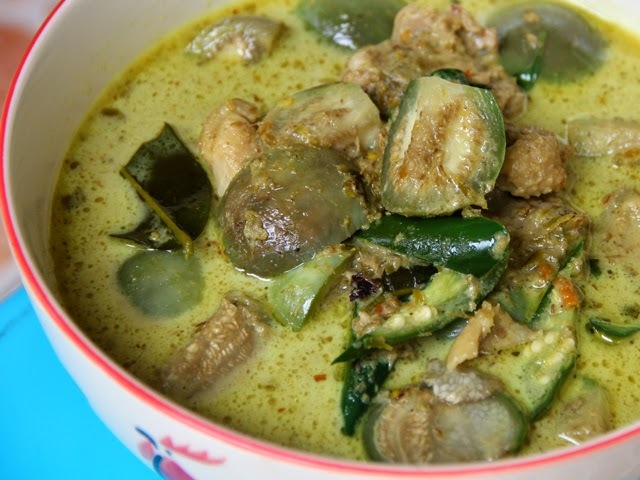 Green Curry is one of the famous Thai dish for foreigners since the original test is not suppose to be too spicy. Otherwise some need to adjust other spicy dishes ingredients which make them loosing a little bit of the original flavour. Add coconut cream and bring back to boil. Add chicken and simmer until tender about 1-2 minutes. Bring back to boil, add both types of eggplant and continue to cook for 1 minute. Season with fish sauce and palm sugar and simmer about 1-2 minutes. Sprinkle with kaffir lime leaves, chilies and basil leaves and continue to cook for another 30 seconds. Renove from the heat and serve with steamed rice. This dish is typically made with chicken meat, however other kinds of meat can be used if preferred, I like to make with seafood and add other vegetable such as carrot, sweet corn, broccoli, etc. One of the Thai dish that never fail me when I introduce them to my foreigner friends is Chicken with cashew nuts, it's a simple dish and very easy to make. Heat the oil in a wok and fry the chicken, turning occasionally for about 3-5 minutes or until tender. Place them to drain on paper towel. Heat the oil in wok and fry garlic until begins to color. 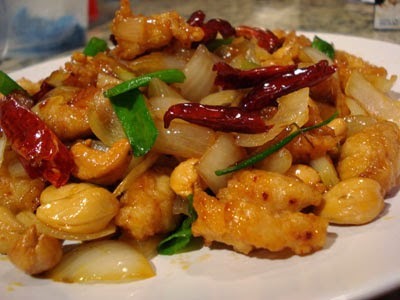 Add onions and cashew nuts then fry until all vegetables are done for about 1-2 minutes. Add chicken and season with oyster sauce, soy sauce, chili paste and sugar until well combined. Sprinkle spring onions and cook for about 30 seconds. Serve sprinkled with coriander leaves and deep-fried dried chillies. You can try to make with beef instead of chicken which I really like though it better to cook it yourself, for some reason many times beef that they use in Thai restaurant here are very chewy. Phuket Cooking Class with Easy Day Thailand. Don't miss it. During a holiday in Thailand food plays an integral part. 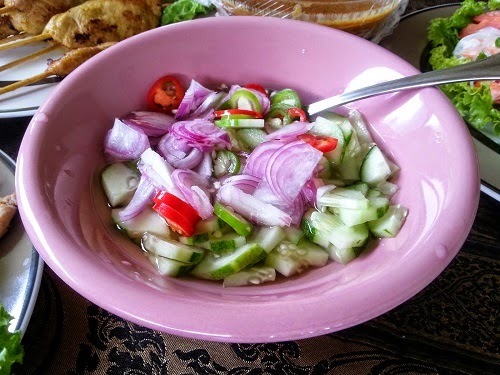 Food here is part of the culture, when you enter someone's house the first question is always "Have you already eaten" or "Gin khao laew yang?". People like to spend time together and eat either at home or at restaurants. Meals are often consumed seated on a floor mat, not at table. Food is shared, steamed rice is served on each one plate and everyone picks the food they like from the central bowls so all diners can enjoy different tastes. Thai people use spoon and fork to eat, no knife and chopsticks only for noodles. Lunch or dinner normally includes three dishes which will include a combination of fish, vegetable, pork, chicken or eggs, a soup and steamed rice. Chilli is very important although not all meals are spicy. 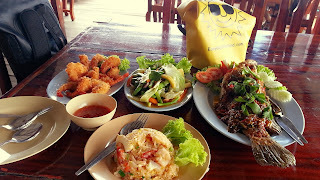 Sitting at a restaurant or during one of our tours you will enjoy authentic Thai food. From sweet and sour to curry, spicy to light soups. Thai food is a blend of many different ingredients including spices, sauces, coconut milk, chilli and....the secret ingredients that every chef or cook keeps for themselves. Now the question is how to put all the ingredients together? When to add what? How much of each ingredient, especially chilli? This is where we come in, with our private cooking classes that specialize in delicious real home cooked food. 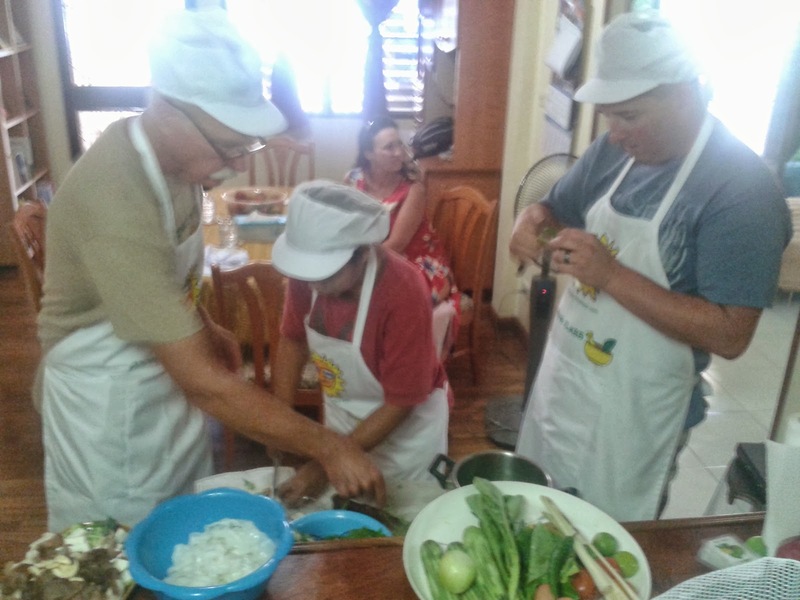 Learn to cook with real Thai's in a friendly and informal environment. Let us introduce you and your friends to the secrets of Thai cooking. We run the classes in our own homes, making you part of our family. This way you not only learn about cooking Thai food but also about the culture surrounding it. 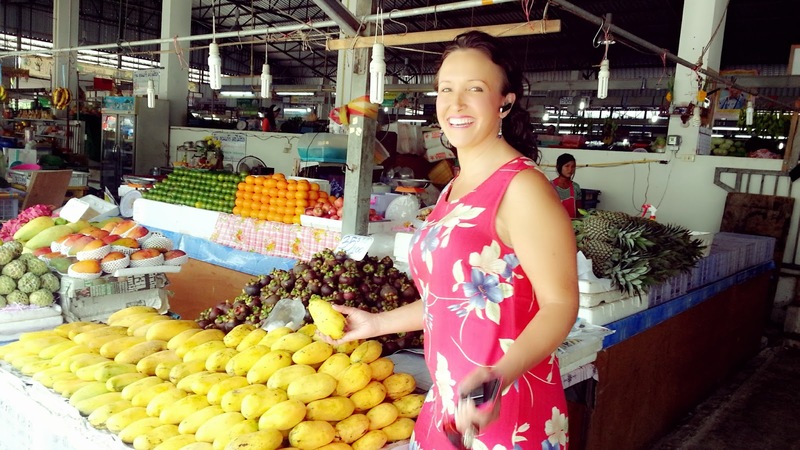 You will get a "taste" of real life Phuket. The cooking class can be done in the morning, then enjoy what you've cooked for lunch. Or you can do the class in the afternoon followed by dinner. 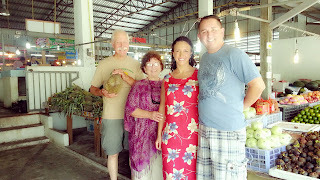 The private Phuket cooking class starts with shopping for the ingredients at the local fresh food market. 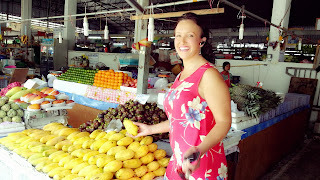 The fresh market is still central to Thai life despite the arrival in Thailand of supermarket chains and shopping with a English speaking Thai person at the market is an experience in itself, you will rarely see a Thai person happier than when they are at the market. The variety of colors and smells will delight your senses. It can be a shock at first, totally different to a what you are used to but you will soon get used to it and discover that it is really enjoyable. Your "teachers" will be with you all time and happy to answer all of your questions, they speak English. They will teach you the names of everything plus we also provide cue cards with photos and names in Thai and English to help you identify each ingredient. Then the real cooking starts. Easy Day Thailand cooking classes are different to others in that the menu is not based on a set menu but "à la carte." You will learn how to cook only your favourite dishes. 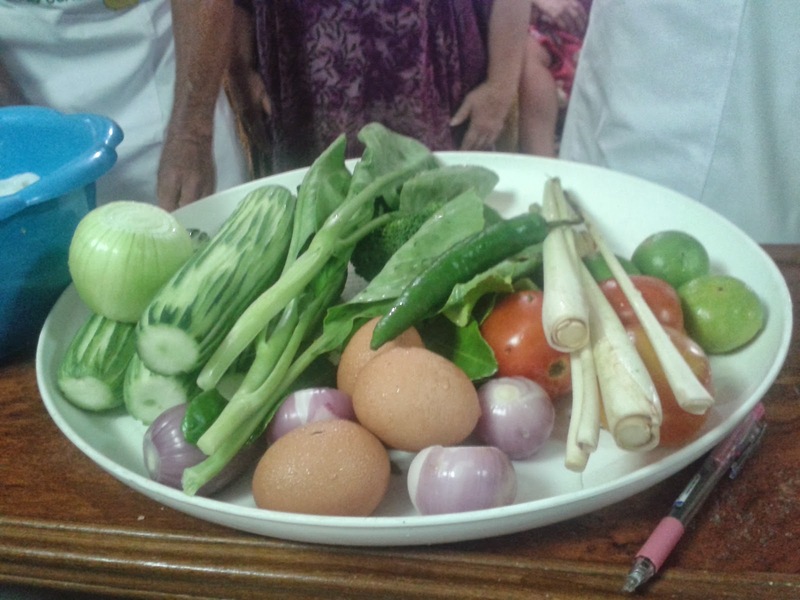 In one cooking class you should be able to learn all your favourite Thai dishes. You will learn how to prepare the ingredients for each dish and how to subtly combine the various spices to produce delicious, flavourful meals. Then enjoy a great home made lunch or dinner. Let us know your favourite local beer and enjoy it with your meal, it's included in the price. 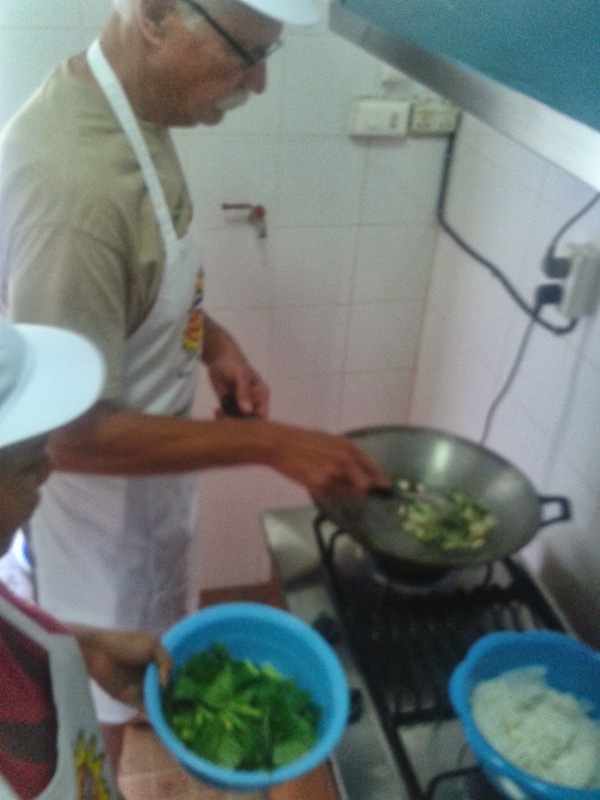 Our Thai cooking classes are available every day with advanced booking. Class sizes are limited to four people however we cook enough food for six people so you can bring friends to enjoy your first attempt at real Thai cooking. After the class we will email you the recipes in pdf format so you will always have them and can share them with friends. The morning class starts with pick up at your hotel at 9:00 hrs, the afternoon class starts with a 15:00 hrs pick up. Our driver will return you to your hotel after the class. Inclusive of transfers from any Phuket hotel, all ingredients for up to four dishes, rice, seasonal fruits, soft drinks, local beers, drinking water, tax and insurance. If you are staying in a private villa and would like us to come to you and teach you in your kitchen that's no problem, we can provide a private Thai cooking class at your place, the price is the same. Robert and Craig - promoted ! For any information or to book your class please contact Sri directly at Sri@easydaythailand.com or use our Contact Form. She is also available if you need any tips or suggestions for cooking Thai Food at home. 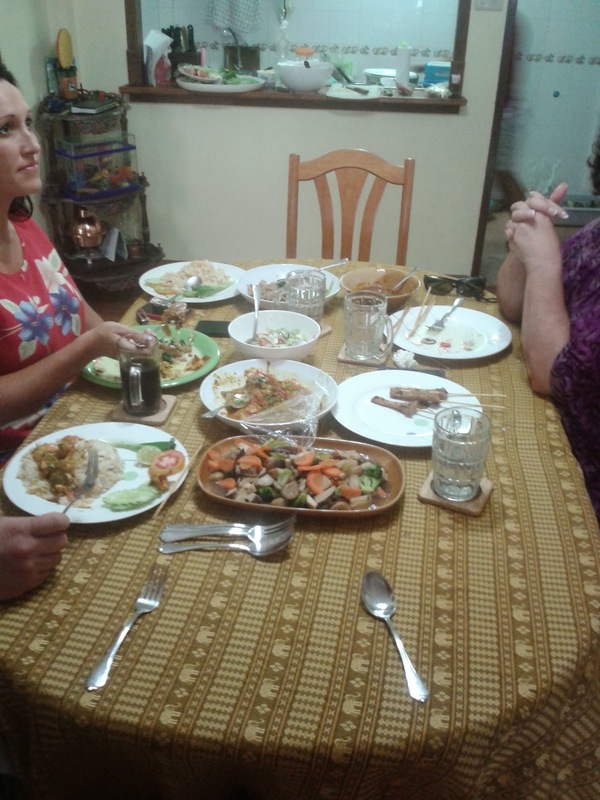 Here is our new solution for a special experience in Thailand, a private Phuket Thai cooking class at a local house, so you will have a touch of home stay in Phuket. 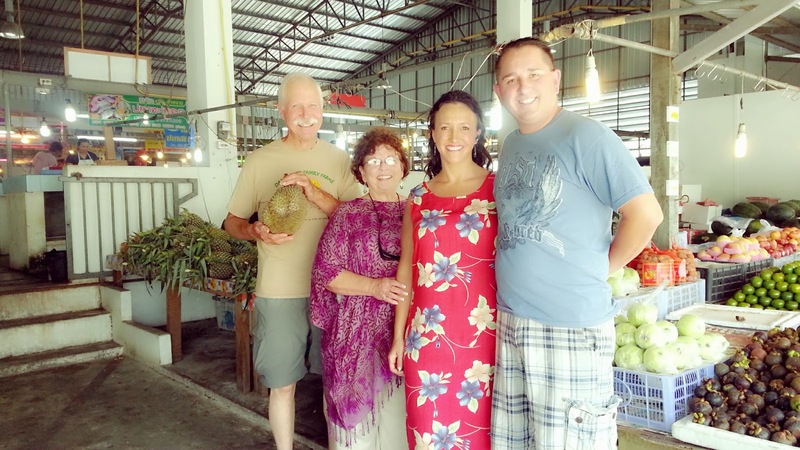 After being transferred from their hotel with a comfortable private minivan, our first guests Edmond & Margaux met our cooks at Kathu Fresh Market to buy the main ingredients for the tasty lunch they were going to cook. Back from shopping at the local market we moved to the house where the cooking class took place, just a few minutes away, and put the special "easy day aprons" on ready for some kitchen action. Many of the vegetables and other ingredients are very different from those you could be used to, so it's very interesting to discover new things and tastes, learning about the various differences and how to use each ingredient. Local restaurants and our expert housewives usually take just few minutes to prepare most of the Thai dishes but in this case our cooks calmly explained all the simple steps of the preparation so the whole lesson took a couple of hours. After taking all these pictures during the preparation and especially smelling all the inviting scents I really was hungry! Finally all the dishes were ready, all looked very good, in fact in Thai culinary culture the visual presentation of each dish is as important as the taste.